The children have been writing to our milk supplier regarding packaging concerns and a posssible increase in litter. The Warriors completed a litter collection and survey and reported results to the Head Teacher then the school during an assembly. The Warriors have further plans to tackle litter and hope to include the whole school. Watch this space! Please inform the school’s office is you cannot attend the meetings in the nursery building. The office must be informed if your child cannot attend. These dates are also displayed on the school's main corridor. Please collect your child form the school's porch area at 3.45pm. Staff are looking forward to lots of exciting sustainable activities with the new Eco Warriors. Warriors - March 2018. You will be soon be receiving some notes regarding our current work. Please read and jot down any ideas. Drop off your written comments to Mrs. Parsons in the nursery building (Thursday/ Friday) or ask your teacher to pop them into the workroom for me. Time: 3:15 to 3:45pm in the Nursery building. PLEASE NOTIFY THE SCHOOL OFFICE OR MRS. PARSONS IF YOU ARE UNABLE TO ATTEND A MEETING. Thank you for all your support. Thank You..... to all the families who entered our hugely successful Awe, Wonder and Wellbeing competition. We have two beautiful display areas in the school relating to this work. Please enjoy the following photographs relating to this work. Entry Details: Ask your child to create their own masterpiece to reflect something that has brought them awe. Tap into their talents using drawing, photography, painting, sculpture or collage. Masterpiece Size: This work will be displayed in the school's hall. Recommended size approximately A5 to A4 size for 2D entries. 3D work to be displayed on units in the hall and/or corridor units. Helpful Pointers: 'Awe' can give you goose bumps, make you feel calm or have a sense of wonder and well being. Choose from: nature, urban (skyscrapers, bridges), indoor (aquariums, cathedrals etc), science, audio (poetry, heroes/ heroines). Younger children: rainbows, fireworks, shells, butterflies, holiday destinations. These are only a few suggestions. Please use your own ideas too. A big thank you to all the workshop providers who visited Well Green week beginning Monday 2nd October. Every class from Reception to Year Six participated in activities relating to sustainability. Staff and children have thoroughly enjoyed these worthwhile sessions. Workshop providers were: Lucinda Hodges from Phoenix Spirit, Emma Houghton from Bollin Valley and David Rome with his many resources to extract honey from a honeycomb. Fabulous! Sharston Recycling Trip with the 2016-2017 Eco Warriors. Following this excellent trip (please see photographs), the Warriors are helping the school to evaluate and improve our waste and recycling behaviour. The Warriors are leading a school assembly based on their trip. Would you like to make a book sculpture? After enjoying a book, why not turn it into something beautiful? A book sculpture is a relaxing activity and lots of fun to make. 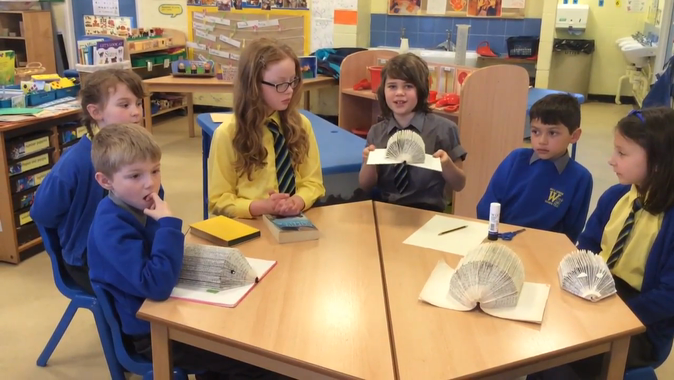 Some of Well Green's Eco Warriors have created a video to help you understand how to make a hedgehog book sculpture. Perhaps you could create leaves for your hog out of newspaper or other recycled paper. The Warriors are busy preparing a new display for the main corridor, a whole school assembly and some book sculptures for around the school. Bin that rubbish! No litter around our school! Keep the air clean. Leave the car behind! Our popular willow tunnel-child height! Eco Warriors won money for playground bins! Education in sustainability enables pupils to develop the knowledge, skills, understanding and values to participate in decisions about the way we do things individually and collectively, both locally and globally, that will improve the quality of life now without damaging the planet for the future. Eco Schools A great website for parents to find out more about sustainability.